Los Angeles: We’re Giving Away Tickets To See Cinematic Titanic At EVERYTHING IS FESTIVAL III! | Birth.Movies.Death. Los Angeles: We’re Giving Away Tickets To See Cinematic Titanic At EVERYTHING IS FESTIVAL III! The former MST3Kers will be heckling Ted Mikel's THE DOLL SQUAD, and we want you to be there. This weekend Everything Is Festival (the annual freakout curated by the mad geniuses at Everything Is Terrible) returns to the Cinefamily, and this outing - their third - looks to be the most explosive and amazing yet. It's a week of mind-shredding weirdness, pants-shitting awesomeness and heart-rending cuteness (they have a show about cat videos!). I will share the whole line-up with you in a moment. But first! But first I want to tell you how you can win tickets to see Cinematic Titanic doing their heckling thing this Saturday as part of the festival. Cinematic Titanic is a group made up of Mystery Science Theater 3000 all-stars Joel Hodgson, Trace Beaulieu, Frank Conniff, J. Elvis Weinstein and Mary Jo Pehl, and they'll be doing some live action joking during a showing of Ted V. Mikels' The Doll Squad. That gem is possibly the inspiration for Charlie's Angels, and like all Mikels films it's brilliant. While you should attempt to see this 70s exploitation madness in a pure state, watching it with these greats doing running commentary should be amazing. - CINEMATIC TITANIC in the subject line. All caps, please. - Your favorite JOEL HODGSON episode of Mystery Science Theater 3000. OPENING NIGHT PARTY @ CINESPIA: Summer Camp Summer Camp - it's a allnighter movie marathon of summer camp-themed delights, raging until dawn: "Wet Hot American Summer", the '80s horror film "Sleepaway Camp", themed video mixes, nature & surfing docs, DJs, photobooths and camp activities! Join us at Hollywood Forever Cemetary, from 7:00pm-6:00am. CLOSING NIGHT PARTY: "Adventures of Pete & Pete" Reunion Panel & Party @ ORPHEUM THEATER in downtown L.A. (co-presented by FYF Fest): We’ll assemble on one stage virtually the entire population of this classic '90s Nickelodeon show (from its creators to its residents), to wax nostalgic about the quintessential show about nostalgia, to explicate inside jokes, to deconstruct the the show’s making, and to listen to a live set by the show's fictional rock band Polaris. Cinematic Titanic live @ SABAN THEATER in Beverly Hills: the writers/performers of the devastatingly funny cult TV show Mystery Science Theater 3000, led by show creator Joel Hodgson, make a live appearance with their new movie-riffing group Cinematic Titanic at the newly-restored historic Saban Theater, to take jabs at the 1973 B-movie actioner "The Doll Squad". Joel (MST3K) Hodgson returns with a “Show and Tell” covering not only his past career and unaired TV experiments, but also his intense personal collection of ventriloquist dummies. 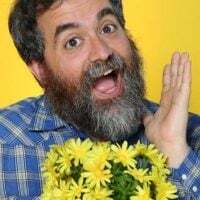 Schrab & Harmon’s Found Crap -- Rob Schrab and Dan Harmon, the creators of "Community" and "The Sarah Silverman Program" share their obsessive collection of jaw-droppingly funny found footage. Everything is Festival Talent Show featuring Nick Offerman ("Parks and Recreation") and a never-before-attempted barbershop quartet live score to highlights from the "Koyaanisqatsi" trilogy. Keynote Presentation by Wayne White: Emmy-winning painter, illustrator, puppeteer, set designer, art director, sculptor and exquisite Southern raconteur Wayne White returns to the Cinefamily stage for a high-energy, laughter-filled spectacle featuring arresting images, video clips and puppets from the artist’s life and thirty-year career on "Pee-Wee's Playhouse" and beyond. The Doug Benson Interruption: Everything is Festival Edition! : Doug and guests (always a surprise, and sometimes including folks like Sarah Silverman, Ed Helms and Zach Galifianakis) get high and get hilarious atop a summer blockbuster (mostly present, sometimes past.) This time around, it's the 2004 M. Night Shyamalan secret-society flick "The Village." Cynthia Rothrock built her action stardom in Hong Kong during the ‘80s, and then returned to American soil by way of films like "Martial Law" and "China O'Brien." We get to spend the whole night with this legend of babe kick-assery. Everything is Terrible! (the monstrous found footage collective responsible for the “Cat Massage” video as seen on Letterman -- and many, many others) presents their brand-new massive mash-up attack on organized religion via VHS: The Rise and Fall of God. G.L.O.W. : The Story of the Gorgeous Ladies of Wrestling. The grappling doc about everyone’s favorite Saturday morning infantile-sexuality conundrum. With director and Ladies of G.L.O.W. in person. Adult Swim’s “Off the Air” (with creator David Hughes in person) brings us the most wonderfully bizarre and disturbingly beautiful short films of our time. Jeff Krulik’s “Heavy Metal Parking Lot” and Other Treasures -- Harry Potter and Neil Diamond Parking Lots too, and more great shorts from Jeff’s filmmaking career. Found Footage Battle Royale 2012 -- The audience enters the arena as festival attendees pit their best clips against each other -- like WWF wrestling but with VHS and more chair-to-noggin contact. The Feline Gaze: The Art of the Cat Film: a sneak preview of the already-gone-viral International Cat Video Festival from Minneapolis’ Walker Art Center, with founder in person -- but we’re also bringing you a rare L.A. screening of CatCam, the first film shot entirely by a kitty, and some serious cat film history courtesy of Cinefamily programmers and their cats. Monsters of Found Footage -- a live panel featuring found footage masters TV Carnage, Animal Charm AND Craig Baldwin crushing each other like Bigfoot (metaphorically) for your viewing pleasure. Cinefamily’s 100 MOST OUTRAGEOUS ACTION SCENES: You loved 100 Most Outrageous Kills, you loved 100 Most Outrageous Fucks, and here comes the third gonzo, mulleted, karate-chopping, eyeball gouging, meathook-ripping -- we could go on -- installment in an ever-more-outrageous series of much-lauded clip shows. Rock 'N' Roll Hotel: Less than a movie, and slightly more than a 90-minute music video (in that it was originally shot in 3D), this 1983 Judd Nelson vehicle was produced, but then disappeared completely, only to be found 30 years later under its set designer’s bed. Tonight we become among the first handful of humans to ever view this Ozymandias of the '80s screen. Star Wars: Uncut -- fifteen-second snatches of "Star Wars" were farmed out to the fan community to reshoot as they saw fit. The results are nothing short of nerdorable.